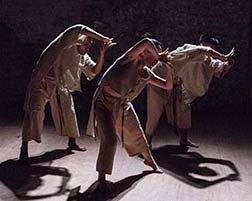 Tjimur Dance Theatre, Choreography by Baru Madiljin. Théâtre des Soies, Avignon Theater Festival OFF, Avignon. July 6 to 29, 2018. Ljaucu Tapurakac, Tzu-En Meng and Ching-Hao Yang. Photo by Michel Cavalca. 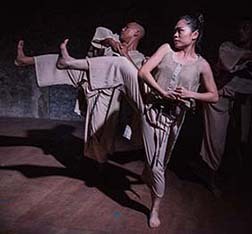 The Tjimur Dance Theatre of Taiwan presents a finely designed contemporary dance inspired by the culture of the Païwan tribe, an aboriginal group of the island’s south. Choreographed by Baru Madiljin, “Varhung – Heart to Heart” is slow, expressive, angular. It tells stories of people’s lives, loves, difficulties though the cultivation and harvesting of the ginger plant. Three dancers, Yang Ching-Hao, Ljaucu Tapurakac and Meng Tzu-En, are dressed in beige flowing pants and tops. The monochromatic music has a hint of Asia. The dancers twist, bend, double over, kick, march and sometimes seem to slide on sand. The piece reflects the Païwan concerns about land, nature and myth. Moves that might seem violent struggles are actually exaggerated gestures that represent the chopping of stalks of the ginger plant, which plays an important role in the life of the tribe. It’s a race to spring. Other moves connect to the nautical life. The Païwan are a people without writing, so songs and dance are way of expressing their emotions. In turn they tell their own stories. A male dancer is in love. The woman feels the pressures of love and life. The three performers express moods of joy, anger, sadness. The choreography has charm and vibrancy, the dancers are accomplished, and the result is a fascinating fusion of traditional inspiration and contemporary dance idiom.